The SACOM™ Digital Wireless System is a full conference or stage microphone system that gives you all the built-in processing you need on every microphone, and offers unique and powerful features unavailable with any other wireless microphone system. The DS series outputs a completely digital wireless signal from transmitter to receiver. This 24-bit digital transmission gives SACOM™ the ability to tailor wireless audio devices to specific application environments. The 1-U receiver chassis holds up to 8 receiver modules. The system has a built-in antenna distribution amp so up to four (4) chassis (or 32-channels) can be daisy-chained together and operate with a single pair of extension antennas. The antenna run can be up to 75 feet with RG58 or about 200 feet with RG8. 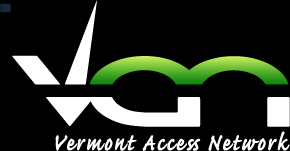 SACOM’s 256-bit encryption algorithm conforms to the US Government AES (FIPS PUB 197) specifications. Sacom™ wireless systems are also available without the encryption feature. There is no compander so it sounds like a wired microphone. Guitar and bass guitar sound like they are wired too. The system is built around NiMH batteries but it will run on alkaline. A free docking station is included with each receiver. You can also power the transmitters using a mini-USB charger or power from the USB port on a computer. The DS engine’s RF technology allows for secure transmissions via certified data encryption without adding latency. Latency is 2.8 mS digital out or 3.8 analog out. Analog and digital out operate simultaneously in parallel. You can repeat the same 32-channelss every 25 or so meters within a building. Output power can be selected for 1, 10, 25, or 50 mW. 25mW provides a range of 100 meters line-of-sight. The system includes free software. It controls all aspects of the system via USB, RS232 or Ethernet. Each receiver has its own MAC address and programmable IP address, so you can daisy-chain I/P control without the expense of a hub. The SACOM™ Remote Software provides a way to assign any two adjacent channels as a redundant pair (pilot and copilot). If anything happens to the “pilot” (say there is an RF hit or a battery dies) the “copilot” takes over instantly without any audible hit or disruption. The system has up to 25 pins of GPIO contact closures. The gooseneck and boundary mic buttons can be programmed to cause an audio mute or a logic mute. The logic mute toggles the GPIO. This allows the automated mixer to monitor the ambient room noise level when mics are muted. GPIO can also be used to mute all mics simultaneously for a sidebar. SACOM™ provides a ¼” balanced mixed audio output on the front panel. The 1-U receiver and a speaker-on-a-stick is all that is required for an impromptu meeting with 8 wireless microphones. SACOM operates in the 902-928 MHz ISM band in North and South American and some Pacific-rim countries. This band is limited to low-powered devices, so there are no TV stations or cell phones. Other frequencies are typically used in other countries. SACOM is a pre-engineered solution. Our engineers provide free antenna system design for your project and set up the parameters so the equipment arrives at the jobsite ready for plug-n-play. However, the free software makes any necessary modifications quick and easy. SACOM™ is made in the U.S.A. 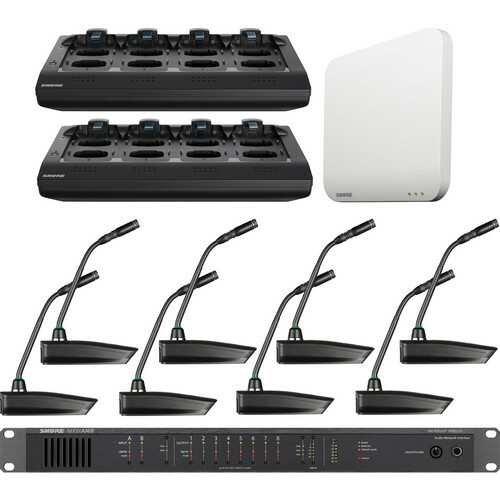 The Microflex 8-Channel 10" Gooseneck Microphone Wireless System from Shure includes 8 MXW8 gooseneck base transmitters with MX410 10" gooseneck microphones, an MXWAPT8 8-channel access point transceiver, an MXWANI8 8-channel audio network interface with connector kit and power cable, 2 MXWNCS8 8-port networked charging stations, and a USB memory stick. The system transmits and receives AES 256-bit encrypted signals to help keep your audio secure and safe. Each of the transmitters has an earphone out, allowing you to listen to a return channel of audio for translation or program material.